Yoshiko Kubota Takemoto at 98 had the honor of being the oldest to attend the Imperial Valley reunion, held in September at the Quiet Cannon in Montebello. Takemoto was born in 1916, the oldest of six siblings. She was delivered by a sanba-san in the area of what is now considered Pasadena but was a part of Los Angeles at the time. Her father worked as a gardener in the Los Angeles area, while at the same time operating a trucking business out of El Centro in Imperial Valley. 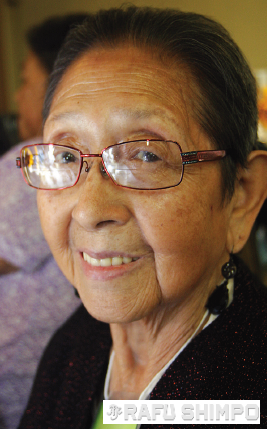 In 1929, the family moved to El Centro, and Takemoto graduated from El Centro High School. Upon her return to the United States, she married an Issei doctor and the couple moved to Arizona. Shortly after Japan attacked Pearl Harbor, her husband was picked up by the FBI and taken away, and she was left by herself to look after two young children. When the U.S. government issued orders for Japanese Americans on the West Coast to report to concentration camps, Takemoto, technically, did not have to comply since Glendale had been split in half, and Japanese Americans living north of the military zone were not required to go to camp. Takemoto made the decision to enter camp. She was sent to Poston (Colorado River), where she was reunited with her parents and others from Imperial Valley. Towards the end of the war, one of her girlfriends was given leave clearance to teach the Japanese language in Boulder, Colo., and then in Chicago. The friend invited Takemoto to join her in Chicago. Takemoto left her two children with her parents at Poston and ventured out to Chicago, where she also found a job teaching Japanese. In July 1946, she was offered a job to Japanese to naval officers in Stillwater, Okla.
By that time, her parents were released from Poston. The parents brought Takemoto’s two children to her in Oklahoma, and the parents resettled in San Diego, where they had friends. When the Navy discontinued the language program after one year, Takemoto and her two children joined her parents in San Diego. At the same time, she decided to divorce her husband, based on personal issues, rather than on anything connected to the loyalty questionnaire. Takemoto supported herself and her children by teaching Japanese in San Diego. Mitsuyo Harry “Hank” Sasaki, 96, a prewar high school football celebrity, was the oldest male at the Imperial Valley Reunion. Asamen, who graduated from Brawley High like Sasaki, said the football rivalry between the Brawley Wildcats and El Centro High Spartans is legendary. Asamen said Sasaki was so feared at El Centro that whenever the Brawley Wildcats were scheduled to go up against the El Centro Spartans, placards went up all over El Centro. After graduating from Brawley High, Sasaki earned a football scholarship to USC. “I’ve always touted Hank as the Trojan’s first Nisei quarterback, but in actuality, he was the first Japanese American to play football at USC in any position,” said Asamen. Asamen also acknowledged other Nisei football greats to come out of Imperial Valley such as George Kita, Shig Imamura and John Masutani. For his part, Sasaki played down his celebrity status. He shared that his father had first been a barber but later bought and operated a grocery business in Brawley. Since his mother was related to the Fukui Mortuary family, he spent the withering Imperial Valley summer months with the Fukuis in Los Angeles’ Little Tokyo. Sasaki received his USC football scholarship and moved to Los Angeles. He laughed as he recalled being the chauffeur for his Grandfather Fukui. 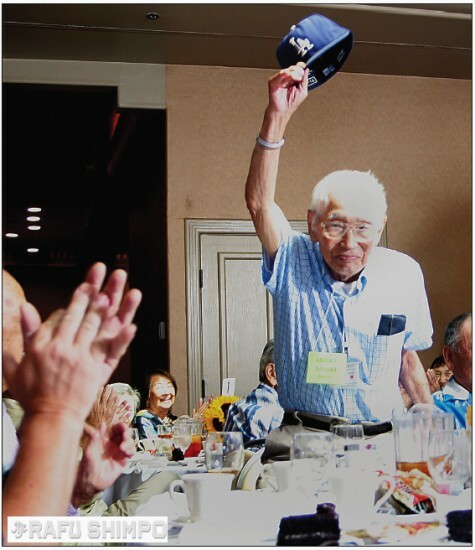 Once World War II broke out, Sasaki and his family, like other Japanese Americans in Imperial Valley, were incarcerated at Poston.